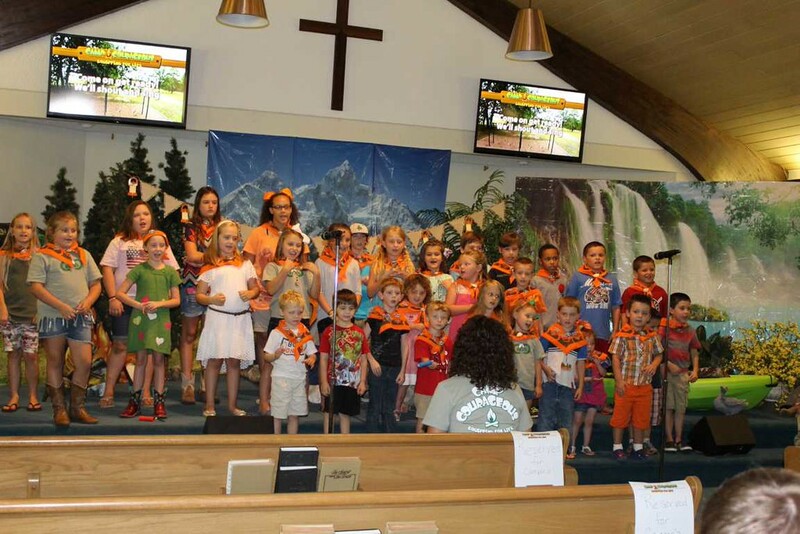 VBS end of week celebration! Fridays are "mom's choice" on the breakfast menu so I pulled out two muffin packages: lemon poppyseed and blueberry cheesecake. Graham and the girls helped me make them but then you would have thought that I was making them eat poison. I believe that Reagan was the only one who ate the lemon muffin happily. Though Anderson became very upset when I gave Graham the top half of his muffin after Anderson had left the bar-he said that he was going to eat that muffin after all. The kids just had 1/2 a day of school today but for some reason it seemed to take them forever. Reagan is getting better at remembering how to do her math but it is still a bit a time consuming. We did have time to read a few stories and to play a few rounds of math uno before heading to Nonna's house to pick up my boy. I do not think that he had been missing us at all but he was glad to see us. Nonna had lunch ready for us so the kids ate and ate and then ate and ate dessert. And when we left Nonna's house we went to see Beebee and they ate and ate candy. Well, I did put a limit to 3 pieces of candy each. As we were leaving today the snow cone man was sitting up outside the nursing home-was he going to pass out free snow cones? was he going to charge the old folks for them?...which makes me think that maybe I shouldn't have let Beebee pass out all of her dollar bills to the kids. Once at home, we had a quiet and wonderful afternoon and right before 6, we headed down the road for the last night of VBS. Keaton had been afraid that we were going to miss the singing all day long-when we woke up she asked when we were going to sing. Then she didn't believe me when I said that VBS was when Robby came home from work. I had to have Campbell convince her.